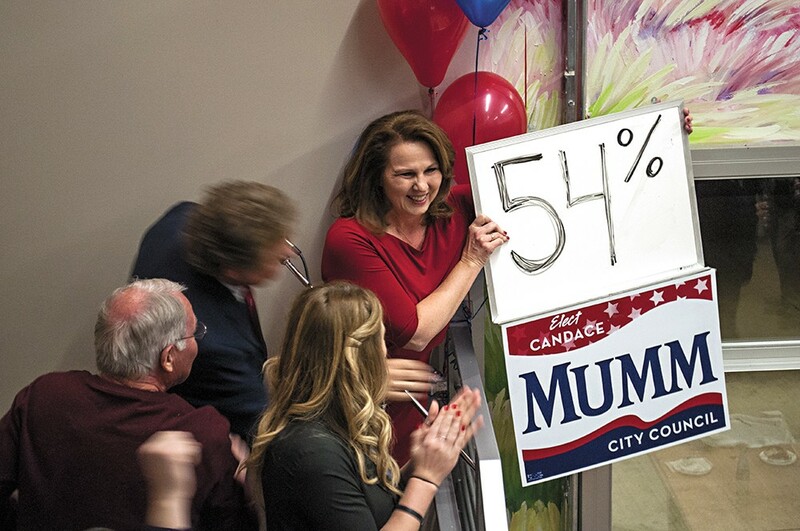 Candance Mumm, backed by Council President Ben Stuckart, celebrates Tuesday night. Even in a non-presidential year and in a technically nonpartisan race, Tuesday's election sent a clear message about the city's current political leanings. With wins for Candace Mumm and Jon Snyder, the Spokane City Council will shift from a 4-3 conservative majority to a union-backed liberal one. In the contentious bid to fill conservative Nancy McLaughlin's seat representing northwest Spokane, Mumm led conservative Michael Cannon 54-45 percent as of press time. The race drew more than $150,000 in campaign contributions and PAC-funded attack ads on TV and in the mail. In the end, money won the day for Mumm who out-fundraised Cannon by $25,000. "The voters I talked to knew I'm a get-'er-done girl, and that's what they wanted," Mumm said among a group of supporters sipping red wine at the Kendall Yards neighborhood clubhouse Tuesday night. "They didn't like all the politics." Michael Cannon and fiancée Jodey Miller check early results Tuesday night at their home. The ideological divide was clear as Cannon — who sat on Mayor David Condon's transition team and chairs the city's Housing and Human Services Board — aligned almost entirely with Condon. Meanwhile, Mumm stood behind liberal Council President Ben Stuckart. The candidates clashed on whether the city should implement a 1 percent property tax increase in the 2014 budget, whether the council should strengthen the city's sit-lie law and whether the mayor's recent moves to increase the number of exempt city positions (in which employees are appointed rather than hired through civil service) were beneficial or dangerous. Cannon saw support from Condon, conservative councilmen Steve Salvatori and Mike Allen and a PAC funded primarily by local construction firms, homebuilder groups and City Administrator Theresa Sanders. Prominent local liberals like Rich Cowan, state Sen. Andy Billig and Stuckart lined up behind Mumm, a former TV news reporter and Plan Commission member who worked on Mary Verner's re-election campaign against Condon. Drawing conservative ire, most of her big contributions came from local and state unions, including firefighters, health care workers and county and city employees. Incumbent Councilman Jon Snyder, a transportation-focused member of the council's current liberal minority, held his seat representing the South Hill, Peaceful Valley and Browne's Addition against a challenge from Republican and former state Rep. John Ahern. While their race never got as testy as the other, Snyder criticized Ahern for being short on specifics and energy. Ahern challenged Snyder on whether he'd done enough to make the city business-friendly, promising he'd look to loosen regulations. Snyder says he was confident he'd hold onto his seat Tuesday, but was "thrilled" with the nearly 30 percent margin by which he won. Ahern, meanwhile, warned of the impact union-supported victories could have on the city. After $27 million and seven months of campaigning, it appears Washington won't become the first state in the country to mandate labeling of genetically engineered foods after all. Early returns on Tuesday night showed Initiative 522 was failing statewide 45 percent to 55 percent. Voters had rejected I-522 in all but three counties — Jefferson, King and Whatcom. In Spokane, 62 percent voted against the measure. Labeling supporters, however, were cautiously optimistic about their initiative's chances. "It is really too close to call. We have hundreds of thousands of votes left to be counted in King County alone," says Elizabeth Larter, a spokeswoman for the Yes on 522 campaign. The Yes on 522 camp, meanwhile, raised just under $8 million. Although thousands of individual donors from Washington state contributed to the pro-labeling camp, the majority of its financial support came from out-of-state organic and natural product companies, such as California-based Dr. Bronner's Magic Soaps, which dedicated $1.7 million to the effort. "They took a tip directly from Vladimir Lenin — that a lie told often enough becomes the truth, and they used $20 million to tell those lies," says Ron Cully, a Spokane volunteer for the Yes side. "I don't think this war is over by any stretch of the imagination." Greater Spokane Inc. and the Spokane County Commissioners certainly didn't undersell their argument for voting for Proposition 1: They tied the very future of Fairchild Air Force Base to the vote, implying economic calamity if taxes weren't raised to buy a series of mobile home parks located in the Fairchild crash zone. But the argument didn't work on the tax-averse Spokane Valley Council nor on Spokane County as a whole. Tuesday night, voters were rejecting Prop. 1 51 percent to 49 percent. As he waits for final tallies, County Commissioner Al French turns his eye to the 4 percent who turned in ballots, but didn't take a stance on the issue. Meanwhile, local nonprofits who planned to help relocate the current residents in the parks could have been a key ally of the county, but expressed deep concerns about the project. While Habitat for Humanity's executive director supported the initiative, John Fisher, with Community Frameworks, remained neutral: "Our stance has always been that the timing was off, that new housing needed to be built before residents were placed." "It means the community is exposed when we go into the next round of [base closures]. I've got to tell you I'm very nervous," French says, adding that there's no way the state or county can afford to buy the properties and relocate the residents. This year, the city of Coeur d'Alene was deeply divided over which mayoral candidate could better fix the city's divisions. Downtown business owner Steve Widmyer and dark-horse candidate Joe Kunka argued that voting for long-time urban renewal critic and recall cheerleader Mary Souza would only pick at the scabs left after the McEuen Field fight. But Souza countered that healing Coeur d'Alene depended on voting for her, a candidate who champions public votes. In the latter days of the campaign, the groups supporting Souza began focusing less on criticizing Widmyer or Kunka, and more on firing salvos at the Coeur d'Alene Press. And a political cartoon published on Souza's site portrays a scraggly-haired ghoul labeled "THE PRESS," warning "Mary might be mayor! Run for your lives! BE VERY AFRAID." In fact, North Idaho Pachyderm Club broke from tradition and announced they would not allow Press editor Mike Patrick to speak in front of the club about the results of the elections because the paper "has been so lopsided in favor of the Widmyer slate, it is really reprehensible and disgusting." Widmyer, for his part, tried mostly to stay out of the fray. For a few moments, an independent Souza-bashing website called "Unfit For Mayor" popped up, but Widmyer says that, even though he didn't have anything to do with the site, he made the suggestion that it be taken down. And it was.